NoSQL Now! Announces Late Breaking Conference News - Read the Press Release. Sponsor White Papers are now available! See the partial list of who will be attending NoSQL Now! this year. Cutting-Edge NoSQL for the London Olympics Presented by John O’Donovan at the NoSQL Now! Conference & Expo. Read the Press Release. 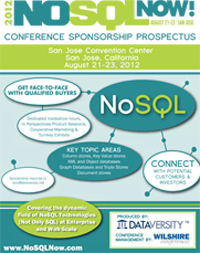 Industry Issues Effecting NoSQL in the Enterprise to be Highlighted at the NoSQL Now! 2012 Conference & Expo. Read the Press Release. Graph Databases are a Hot Topic at the NoSQL Now! Conference this Year - Read the Press Release. Robert Scoble to Chair NoSQL C-Level Panel- Read the Press Release. Dataversity’s NoSQL Now! Conference & Expo Announces its Agenda and Opens Registration - Read the Press Release. Meet the Members of the 2012 NoSQL Now! Program Advisory Committee (PAC)! See the list of decision makers who attended the 2011 NoSQL Now! Conference. NoSQL Now! 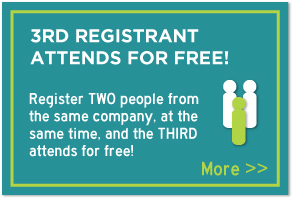 is a conference covering the dynamic field of NoSQL technologies (Not Only SQL). The goal of the educational conference is to describe the diversity of NoSQL technologies available to all organizations to address their business needs, and to offer objective evaluation processes to match the right NoSQL solutions with the right business challenge. At the inaugural NoSQL Now! event in 2011, over 500 people attended and enjoyed a rich educational program and energized exhibit floor. We expect almost double that attendance in 2012. NoSQL Now! is intended for every enterprise that needs to find better, faster and cheaper solutions to managing its fast growing databases and data stores. The educational program will be designed to accommodate all levels of technical understanding, from novice through expert, with an emphasis on the design and management needs of enterprise IT and big data applications. The venue will also provide opportunities for CTOs, developers and software entrepreneurs to meet and mix with potential customers and investors. If you would like information about sponsorship, or opportunities to promote your products and services, please contact Tony Shaw at tony@dataversity.net. Click here to download the PDF Conference Prospectus.